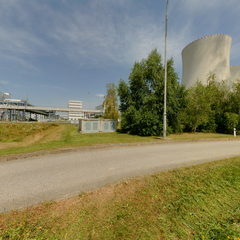 The Temelín Nuclear Power Plant is situated approximately 24 km away from České Budějovice and 5 km from Týn nad Vltavou. It generates electricity in two units with VVER 1000 pressurised water reactors, type V 320. 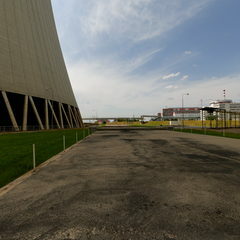 The first reactor was loaded with fuel in July 2000. 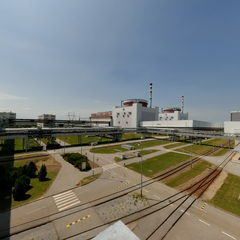 Unit 1 generated its first electricity on 21 December 2000. 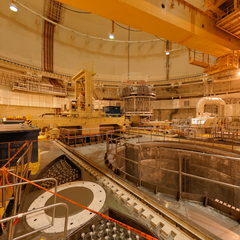 Unit 2 was put into operation in 2002. Before that, southern Bohemia was dependent on electricity supplied from other areas, in particular environmentally burdened northern Bohemia. The Temelín power plant allowed replacing more than 2,000 MW in outdated coal-fired units that have progressively been shut down. Today, after more technological improvements, Temelín has an installed capacity of 2 x 1,055 MW. An untight area consisting of the basemat, outer shell and vent stack. The containment building is a massive reinforced concrete structure, 56 metres tall. It consists of a cylinder and a spherical cap. The walls of the cylinder are 1.2 metres thick, the dome structure is just ten centimetres thinner. 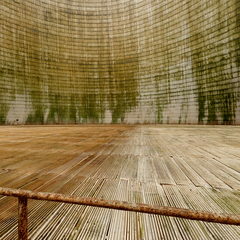 The inner diameter of the containment is 45 metres. The unit control room simulator is a true replica of the unit control room. Consistency of parameters and controls between the simulator and the control room is checked regularly. It is used as a training device for operators. 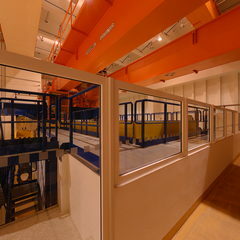 The connecting corridor runs from locker rooms in the nuclear auxiliary building to Unit 1 and Unit 2. 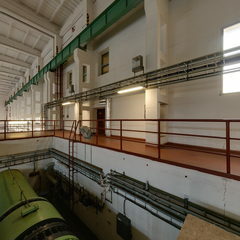 The virtual entrance into the controlled zone of the power plant. The controlled area consists of the power plant’s premises where a higher level of ionising radiation or radionuclides may occur. Such premises are subject to specific technical and administrative measures. 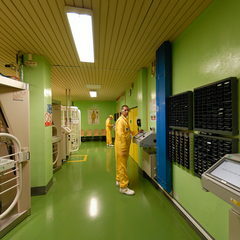 People have to change into yellow overalls before entering the controlled area and pass through a sanitary locker room when exiting; it is important to use dosimeters. 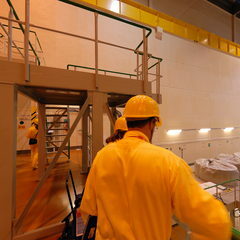 Personnel walk along the connecting corridor from lockers in the nuclear auxiliary building to the individual reactor units. 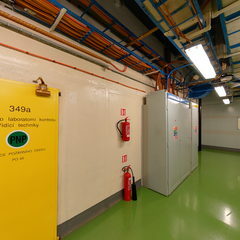 Corridors for access to the controlled area are lined with pipes bearing exact identification of the media inside. Pipes and electrical cables pass through the perimeter of the pressure-tight area using special air-tight penetration assemblies. The quality and reliability of the penetration assemblies are checked by component tests during manufacture and before the installation of each penetration. They are also checked regularly throughout the power plant’s life. The outer shell also covers the unit and emergency control rooms, at different places, and auxiliary primary circuit systems. Entrances to the containment building open only inwards and one by one: when one door is opened, the other door cannot be opened. Door opening is secured by three independent methods. The containment is one of the power plant’s safety barriers, both to the environment and to other equipment. It forms the perimeter of the pressure-tight area. The containment encloses the most important parts of the power plant – the entire primary circuit and other safety and auxiliary systems. The containment building is a massive reinforced concrete structure, 56 metres tall. It consists of a cylinder and a spherical cap. The walls of the cylinder are 1.2 metres thick, the dome structure is just ten centimetres thinner. The inner surface of the containment is lined with an 8 mm layer of stainless steel, which seals the containment interior preventing radionuclides from leaking into the environment. The containment is designed for a maximum overpressure of 0.49 MPa at 150 °C. Negative pressure is maintained inside the containment to allow any small radioactive leaks to be filtered out. Low-level residues would then be released through the vent stack in a controlled manner. In case of a more serious accident, the ventilation system would be shut down to localise radioactivity inside the containment. The containment structure is made of prestressed concrete. Prestressing is achieved through prestressed steel cables running through the entire containment structure. In addition to the above-mentioned functions, the containment protects the internal equipment against external impacts (an airplane crash, blast waves, third-party impacts, gales, extreme temperatures, extreme precipitation). The spent fuel pool is located next to the reactor well inside the containment so that refuelling is carried out inside the sealed containment area. Personnel access and material transport to the pressure-tight containment area is allowed by double gas-tight hatches with an airlock. There is a refuelling shutdown currently taking place in the containment of Unit 1. About ¼ of the fuel assemblies are replaced every year. The containment is unattended during the year. The operation is monitored in the unit control room and routine checks are carried once a year. 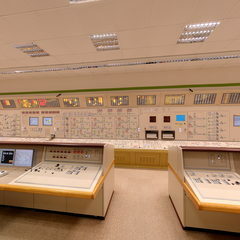 In addition to the unit control room, operations in the reactor hall are monitored by the International Atomic Energy Agency with headquarters in Vienna. The IAEA has online access to all power plants that signed a nuclear fuel movement agreement. It checks the progress of regular shutdowns, among other things, and when the upper assembly of the reactor is removed there is a special inspection by an IAEA inspector who arrives, checks correct refuelling, and puts a seal on the newly assembled reactor. The reactor well contains the reactor pressure vessel. The well is interconnected with the spent fuel pool. The pressure vessel contains the internals of the reactor, including its core. The pressure vessel is about 11 m high, with an outer diameter of about 4.5 m. The thickness of the wall of its cylindrical part is 193 mm. The vessel is designed for a pressure of 17.6 MPa at 350 °C (the operating pressure is 15.7 MPa at 290-320 °C) and is made of high-quality, low-alloy chromium-nickel-molybdenum-vanadium steel. It was made by ŠKODA JS Plzeň using special technology in order to ensure the required radiation resistance of the material. To monitor the embrittlement of the pressure vessel due to neutron irradiation, surveillance samples of material were placed in the reactor and are regularly measured and evaluated in the Nuclear Research Institute in Řež. The removable head of the reactor vessel is attached to the cylindrical part using hydraulically prestressed studs and sealed with two metal self-sealing rings, the tightness of which is constantly monitored. The emergency spray system can be seen on the ceiling of the containment. The entire containment building is kept under negative pressure. In case of failure, with steam gathering in the premises, the entire area would be automatically sprayed with cold water to cool down the leaked steam. This would prevent overpressure and provide time to deal with the failure. During a shutdown, the reactor head is unsealed, reactor superstructures are dismantled and removed, and the entire reactor well is filled with water that provides shielding from radiation. The refuelling machine travels above the reactor, removes spent fuel assemblies, moves them underwater into the spent fuel pool, rearranges fuel rods in the core and inserts new, fresh fuel elements. The guide tube assembly is then mounted and the upper assembly with wiring connections is installed on it. Water is pumped out of the well and the reactor head is sealed. During the exchange, the fuel is handled under the water, which is a sufficient barrier for radiation shielding. 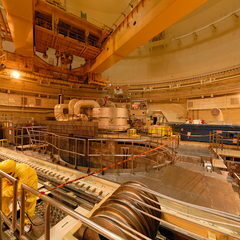 The upper part of the reactor is approximately 12 metres below the point where we currently are in the virtual walk. 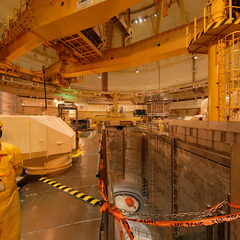 During operation, the pit is filled by the upper assembly of the reactor. At the bottom of the pit is the main flange joint, on top of which the individual components of the upper assembly are mounted. Fuel assemblies are in the storage pool right now, with fuel safely stored underwater to cause no harm to power plant personnel. A fuel assembly has the shape of a hexagonal prism, with a height of about 4,5 m and a “custom-made” dimension of 235 mm. It consists of 312 fuel rods, about 9 mm in diameter and 4 m long. A spacing plate with supports for fuel assemblies is seated on the inner shoulder of the perforated elliptical bottom of the core barrel. The perforated barrel bottom serves to direct and balance coolant flow through the reactor core section. The shroud protects the pressure vessel against the effects of neutron flux. Seated on the top of the core is the guide tube assembly, which determines spacing between fuel assemblies and transfers data from in-core instruments. The reactor core has a height of 3,530 mm and a diameter of 3,160 mm and consists of a total of 163 fuel assemblies and 61 control rods (clusters). The fuel assemblies are arranged in a hexagonal grid. Each fuel assembly consists of 312 fuel rods, 18 guide tubes and one central measuring tube. The core is located in the reactor pressure vessel. The fuel assemblies, made by Russian company TVEL, are located at precisely defined positions in the core. A full load consists of 92 tonnes of fuel, consisting of slightly enriched uranium U-235 in the form of uranium dioxide. About 1/4 of fuel assemblies are removed from the core every year during refuelling. 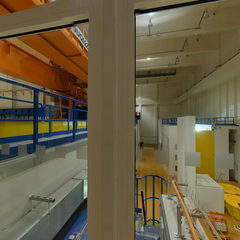 The storage pool is situated behind a closing slide, which opens when the reactor well is filled with water. The refuelling machine moves fuel assemblies from the reactor to the pool; all takes place underwater. Four steam generators generate the steam that drives the turbine generator. It has a pressure of 6.3 MPa and a temperature of 278.5 °C. A steam generator is a horizontal cylindrical exchanger, 14.8 m long, with an outer diameter of 4.2-4.5 m. The steam generators are made of low-alloy structural steel. The heat-exchange tubes are made of chromium-nickel stainless steel. 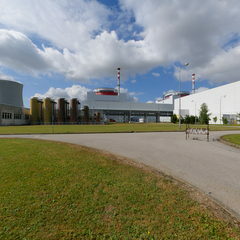 The steam generators for the Temelín NPP were made by VÍTKOVICE, a. s. The steam generators cannot be seen; they are located in rooms under the reactor hall floor, alongside the reactor. Main coolant pumps, one in each of the four coolant loops, ensure coolant circulation in the primary circuit to remove heat from the reactor to the steam generator. Vertical, centrifugal, single-stage pumps are used, which are located on the cold legs of the primary circuit circulation loops. The pumps are 11.9 m high; their power input is 5.1 MW under rated conditions. The flow rate of one pump is 21,200 m3/hr under rated conditions. Trouble-free operation is ensured by auxiliary systems (oil treatment plant, seal water, autonomous cooling circuit and washed seals). The pressuriser system compensates for volume and pressure variations in primary circuit coolant. The main part of the system is the pressuriser (a vessel 16 m high and 3.5 m in diameter), inseparably connected to the primary circuit. It is filled with two-thirds of primary circuit coolant and one-third of steam. Pressure in the primary circuit is controlled by the pressure of steam in the upper part of the pressuriser. When pressure in the primary circuit drops, electric heaters in the lower part of the pressuriser turn on. This increases the volume of steam in the upper part of the pressuriser and, consequently, pressure in the primary circuit. When pressure in the primary circuit exceeds a predefined level, this activates the sprinkler system in the upper part of the pressuriser. Its operation reduces the volume of steam in the steam part of the pressuriser, which results in reduced pressure in the primary circuit. If the sprinkler system failed to provide the pressure drop needed in the primary circuit, a relief valve and, if necessary, safety valves would open. Steam flows through those valves to the bubble condenser tank, condensing there and, if the safety valves are opened for a prolonged time, passing to collection pools in pressure-tight areas. 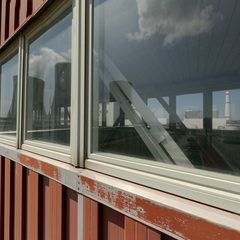 The pressuriser and the bubble condenser tank are made by VÍTKOVICE, a. s.
The fresh fuel storage is located in the nuclear auxiliary building. Since nuclear material is stored here, this is one of the most secured buildings on the power plant’s site. Fresh fuel assemblies are stored in special containers here. Before they are put into the containers, they are checked visually. 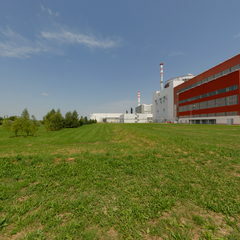 In terms of radiation protection, the storage premises are subject to the same rules as the power plant’s controlled area. Until fission reaction occurs in fuel, its radioactivity is just slightly higher than background radiation. Since 2010, fuel for the Temelín NPP has been delivered by Russian company TVEL, which won the contract in 2006, replacing US company Westinghouse after ten years. The left side of the spent fuel storage area is used to store Castor storage casks. These contain spent fuel that was in the reactor once and has been cooled in the storage pool for ten years. In the middle of the storage area is a connecting part with a place for working on protection plates, secondary lids and chips. The area on the right is prepared for possible extension of the storage facility. Today’s capacity is enough for 30 years of operation. The power plant’s first unit was put into operation in 2000, the first refuelling was carried out in 2002 and the first Castor was not filled until 2010, when US Westinghouse fuel was replaced with Russian TVEL fuel and all 163 fuel assemblies were replaced. There were 14 cask spots occupied in 2013, with two or three casks per unit being added after each shutdown, totaling four to six per year. The fuel will be stored in the casks for up to 60 years, during which it will be cooled constantly by airflow in the storage facility. The activity of spent fuel is also decreasing all the time. Unless it is used otherwise when its storage time expires, the fuel will be declared waste and disposed of permanently in a deep geological repository. The Radioactive Waste Repository Authority (RAWRA) plans to open a deep geological repository in about 2065. The storage facility is unattended and monitored permanently. 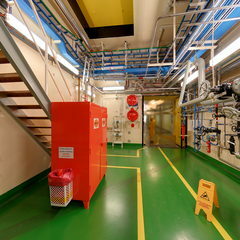 Temperature and pressure in the casks are monitored, with camera surveillance by the International Atomic Energy Agency. 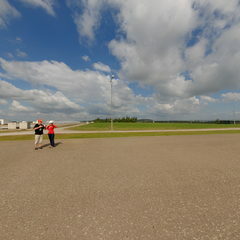 There is minimum traffic in both storage areas, the fresh fuel and the spent fuel storage facilities. In terms of security, these are among the most strictly controlled areas of the power plant. The Castor cask is a robust container weighing 95 tonnes when empty and almost 110 tonnes when filled. Its top part, protection plate, secondary lid or chips are repaired in the central part of the storage facility if needed. The secondary lid seals the space between the primary lid and the top jacket. The gap is filled with helium, which exerts constant pressure in between the lids and allows monitoring its changes. In the event of a failure of the primary lid, directly covering fuel, the container is transported to the storage pool in the reactor hall and repaired safely underwater. This is a system that serves to improve steam parameters after it passes the high-pressure part of the turbine. Its task is to reheat steam to 250 °C and separate formed water droplets to prevent damage to the low-pressure blades. Special louvers are used to reheat the water and separate the droplets. Each turbine has two separators, located at both sides of the machine in a mirrored arrangement. The turbine building contains the main equipment of the secondary circuit. The most important piece of equipment is the 1,055 MW turbine generator, which consists of a steam turbine, electric generator, exciter and auxiliary exciter. The steam turbine consists of one high-pressure and three low-pressure components. Horizontal separators / steam reheaters are located at both sides of the turbine. A condenser is located underneath each low-pressure turbine component. Other important systems of the secondary circuit include the condensation and recovery systems. The steam turbine, a prototype machine made by Škoda Plzeň, consists of three low-pressure and one high-pressure rotors. Steam at 280°C and 6.3 MPa is fed through a pipe to the high-pressure part of the turbine first, where it drives the blades to spin the turbine. The steam loses about 40% of its energy here. The rest of its energy is used in the three low-pressure parts of the turbine, to which the steam is fed from the high-pressure part after being heated and dried. The steam drives the rotor blades to spin the turbine at 3,000 rpm. 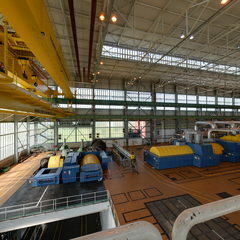 The turbine building contains the main equipment of the secondary circuit. The most important piece of equipment is the 1,055 MW turbine generator, which consists of a steam turbine, electric generator, exciter and auxiliary exciter. The steam turbine consists of one high-pressure and three low-pressure components. Horizontal separators / steam reheaters are located at both sides of the turbine. A condenser is located underneath each low-pressure turbine component. Other important systems of the secondary circuit include the condensation and recovery systems. After having its voltage raised from 24 kV to 400 kV in transformers, electricity obtained. The electric generator (turbo-alternator) shares the same shaft with the turbine. After technical modifications made to various parts of the power plant, its power output has been 1,055 MWesince September 2013. Its weight is 564 tonnes; it is cooled by hydrogen and water. The generator rotor has a field winding that creates a magnetic field. Electric current is generated in the stator winding. 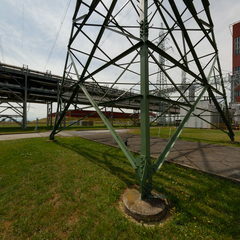 After having its voltage raised from 24 kV to 400 kV, electricity obtained from the generator is delivered to the grid at the Kočín substation, which is located 2 km south of the power plant. Steam that has passed through the turbine has delivered its energy, lost its temperature and changed into a mix of steam and water that needs to be cooled down to form condensate. This is done in the condenser, which contains almost 32,000 titanium cooling pipes. Such a high number is required to obtain as big a surface area as possible to condensate steam arriving from the turbine. The steam condensates on the surface of the pipes; third circuit cooling water flows inside and is fed by pumps into the cooling towers. 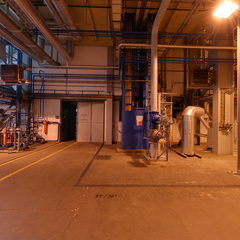 Various systems then increase condensate temperature to 219 °C and this water is then delivered to the steam generator. Here it transforms into steam that is fed back to the turbine. Electricity generated by the generator is delivered to the high-voltage grid through unit transformers that raise its voltage from 24 kV to 400 kV. The electricity is then supplied to the Kočín substation, about 2 km south of the power plant. 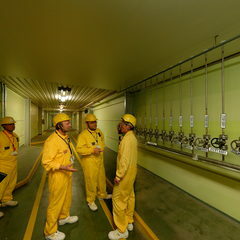 The nuclear plant’s reliable and safe operation also depends on a reliable supply of cooling water. The outer cooling circuits are supplied with water that is pumped from the Vltava. Water is supplied to water reservoirs at the power plant and some of it is delivered to the chemical treatment plant (demineralisation line) to produce demineralised water, which is used in the primary and secondary circuits; the rest is delivered to the cooling water treatment plant and then to the power plant’s cooling systems. The outer cooling circuits consist of a cooling circulating water circuit and service water circuits. The Temelín Nuclear Power Plant was originally designed to have 4 units. A decision to only build two of them was made in the early 1990s. The site is ready and awaiting a decision to build the two additional units 3 & 4. The cooling towers are the power plant’s dominant feature, rising up to 155 m. In full operation, they release 413 litres of steam per minute. The closed circuit between the condensers and the cooling towers with forced water circulation ensured by pumps is called the tertiary cooling circuit. 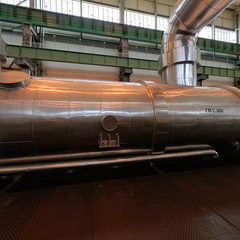 It serves to condensate steam delivered from the turbine. Warm water from condensers (30 °C) is cooled in four hyperboloid, natural draught cooling towers. The condenser cooling water is delivered by pipes to the top of the tower and then sprayed onto fill made of PVC blocks inside the tower. While the water is flowing slowly through the fill, it is cooled by cold air flowing from underneath. Some water evaporates in the process (about 0.3 m3/s per tower). Cooled water from the towers falls in the form of water droplets into the collecting pool below the tower. From there it flows into the pumping station by gravity, then the pumps transport it back into the condensers and from there the heated water is transported back into the towers for cooling. Only clean water vapour rises in the air. The connecting corridor between the nuclear power plant’s buildings and units is located 15 m above ground. From the eastern part of the footbridge, you can see the skylights at the top of shops and storage facilities with replacement parts for inspections. 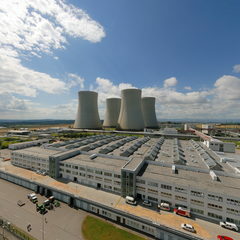 You cannot overlook the power plant’s dominant feature, the four 155 m cooling towers. The connecting corridor between the nuclear power plant’s buildings and units is located 15 m above ground. On the right you can see buildings for suppliers, the training centre, sprinkler pools, the nuclear auxiliary building, the connecting bridge in the controlled area between Units 1 and 2, the turbine building and other service buildings. TThe spray pools are the cooling unit of technical water, which secures cooling of safety important equipment. According to its purpose, service water is classified as essential service water and non-essential service water. The essential service water system (closed circuit) provides cooling for plant components that are essential for nuclear safety. It consists of three independent systems, with the water cooled in the sprinkler pools. The entire essential service water is connected to a stand-by power supply system. 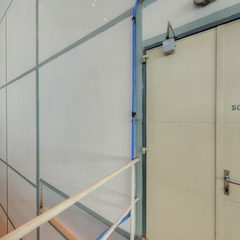 The non-essential service water system (open circuit) provides water for cooling appliances in the main generation units and the auxiliary building. These are appliances whose cooling water supply may be interrupted. The system water is cooled directly in the cooling towers, in a circulation water system. This is a system that does not participate in emergency reactor aftercooling. Therefore it is not essential for nuclear safety and is not connected to stand-by power supply. The Hněvkovice Hydro Power Plant is part of the Vltava cascade and was built simultaneously with the Temelín Nuclear Power Plant. The dam contains 22.2 million m3 of water, its water surface is 312 ha and its 18.6 km backwater spreads to the weir in Hluboká nad Vltavou near České Budějovice. The dam serves for hydroelectricity generation at a semi-peak load hydro power plant and, especially, as a reservoir of service water for the Temelín power plant’s site. To this end, a powerful pumping station with a 110 kV substation was built on the left bank near the dam and the hydro power plant. The Hněvkovice dam was built in 1986-92. 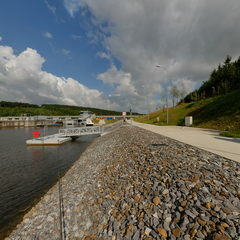 Its concrete gravity dam with a height of 16.5 m connects the two banks with a 191 m bridge road on the crest of the dam. The dam includes 3 built-in spillways, 12 m wide, gated by steel segments with electric drives, a bottom outlet and the construction part of a lock. The hydro power plant, which is built into the left-bank part of the dam, includes 2 units with Kaplan turbines. They are located in a concrete extension of the toe of the dam. Generator wells are covered with steel plates to protect them against weather. The standard river power plant has inlet stop logs, trash racks, 4.3 x 6 m steel gates, concrete draft tubes, wheel pits and outlet stop logs. A cleaning machine is installed at the inlet to clean the trash racks. Electricity from the 6.3 kV generators is supplied directly to the substation of the Temelín power plant’s pumping station. The hydro power plant’s operation is fully automated. It is controlled remotely from the Štěchovice control central of the Vltava cascade, which also monitors the operation of the nearby Kořensko hydro power plant downstream. The machines are colour-coded for easier identification. Electrical or water machines are green, the brown machines are oil systems. Systems working with air are blue. 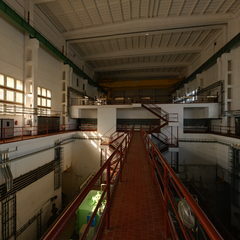 The pumps and air chambers (blue, in the rear) push water from the reservoir to the power plant. Usually two of the six pumps are in operation. The main pumps have a pumping power of 6.7 MW. The remaining four pumps are a double standby in case of a failure. This is because the nuclear plant’s water supply is one of its safety systems.